Healthy Cooking: How to Steam Shrimp and Vegetables with a Kick! 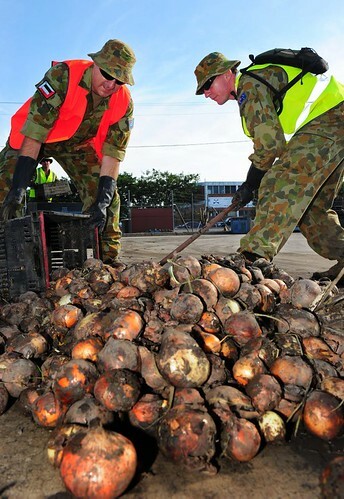 Army Reserve soldiers from D Company, 9th Battalion Royal Queensland Regiment (D Coy, 9 RQR), collect rotting vegetables at the Brisbane Markets in Rocklea. Australian Defence Force personnel from D Company, 9th Battalion Royal Queensland Regiment (D Coy, 9 RQR), assisted with the huge clean-up effort at the Brisbane Markets in Rocklea. Soldiers who had travelled to Brisbane from different locations around the state, worked to remove rotting food and flood-damaged debris as well as hose down and sanitise shopfronts and fence lines. A storeroom was also established to enable civilian volunteers to collect safety equipment such as high-visibility vests, safety glasses and dust masks. Over the past two days supplies were issued to over 1,000 civilian and Defence volunteers to ensure Australian Standards of Occupational Health and Safety were achieved. The Brisbane Markets supply 80% of Queensland’s fresh produce and it is essential that the clean-up is completed to the standards required by Brisbane City Council and Queensland Health Departments. Members of the Australian Navy, Army and Air Force are serving as part of Operation Queensland Flood Assist to support the Queensland Government in dealing with the flood emergency that confronted the state during December 2010 and January 2011.